Prepare your weapons and start your engines: only you, the best trained and most lethal pilot in the galaxy, can face the Meroptian menace. Abylight and Locomalito are excited to announce the release platforms and date of Super Hydorah, an indie shoot’em up that condense the best of the classics of the genre in an intense non-linear gameplay experience. Super Hydorah will be released on September 20th for Steam and Xbox One, for a price of $11,99 / €11,99. This new game by Abylight and Locomalito is available for Pre-order for Xbox One and available to add to your whishlist on Steam. Are you press or a streamer and to test your skills as a pilot to save the galaxy? Ask us for a review key for Super Hydorah! 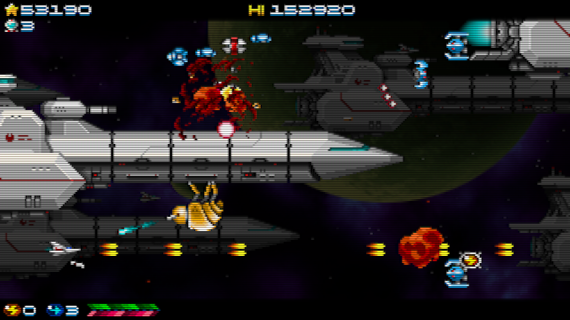 Super Hydorah is a side scroller non-linear SHMUP which gives the player a challenging experience with the best from the greatest classics of the genre: straightforward action, old school visuals and a wide array of content with unique space settings. Super Hydorah pays homage to the 16 and 32 bits era with its art style and an original soundtrack with more than 60 songs. Also, its gameplay gives yet another turn of the screw to the shoot’em up genre, with an extremely precise control and 21 non linear levels, divided into 35 sublevels, and different gameplay modes. Check out all the details about Super Hydorah at our presskit and the key features at the game page! Tags: Gryzor87, Locomalito, press release, SHMUP, shoot'em up, Steam, xbox one.